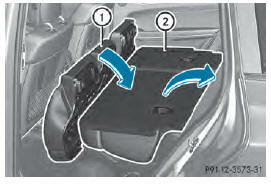 If the rear bench seat/rear seat and seat backrest are not engaged they could fold forwards, e.g. when braking suddenly or in the event of an accident. • The vehicle occupant would thereby be pushed into the seat belt by the rear bench seat/rear seat or by the seat backrest. The seat belt can no longer offer the intended level of protection and could even cause injuries. • Objects or loads in the trunk/cargo compartment cannot be restrained by the seat backrest. Before every trip, make sure that the seat backrests and the rear bench seat/rear seat are engaged. Release and fold the seat cushion upwards before folding the rear bench seat forward. Otherwise, the backrests may be damaged. When the backrest is folded forwards, the front seats cannot be moved to their rearmost position. Otherwise, the front seats and the rear bench seat could be damaged. Observe the loading guidelines . The left-hand and right-hand backrests in the second row of seats can be folded forwards separately to increase the cargo compartment capacity. On vehicles with a 3rd row of seats, you must fold down the 3rd row of seats beforehand to obtain maximum cargo compartment enlargement. The backrest is heavy. Therefore, take care when folding it down. 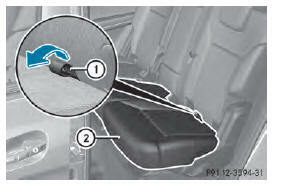 Make sure that the head restraints are pushed all the way in so that the backrests and seat cushions are not damaged. If the driver's or front-passenger seat is set for a larger person, it may not be possible to fold the rear bench seat forwards. In this case, move the front seats as far forward as possible. ■ Move the head restraints to the lowest position . ■ Pull release loop 1 of seat cushion 2. ■ Fold seat cushion 2 upwards. ■ Pull release handle 3 in the direction of the arrow. ■ Fold the backrest forwards until it reaches the cargo compartment position. ■ Guide seat belts 2 under respective clips 1. 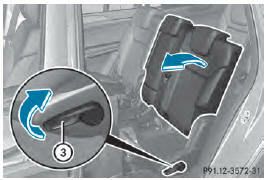 ■ Fold seat backrest 2 back until it engages. Make sure not to trap the seat belt while doing so. ■ Swing seat cushion 1 back. ■ Pull up and adjust the head restraints if necessary .